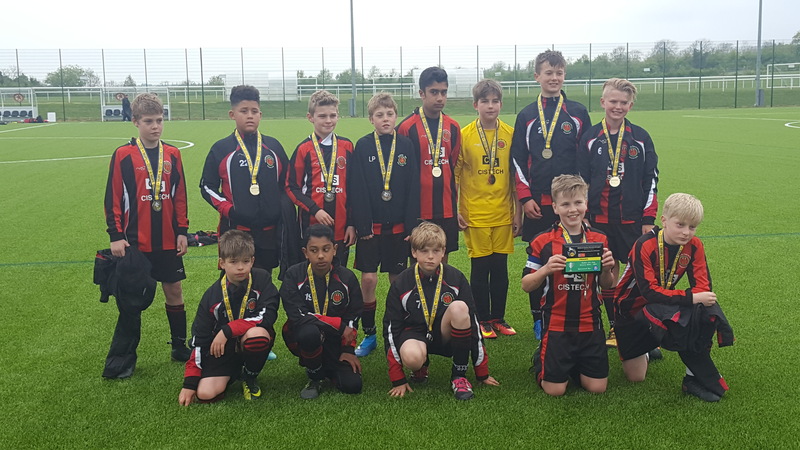 Unfortunately we the Pirates lost their MJPL Cup Final on Saturday, a very narrow 1-0 defeat to Oadby Owls from Leicestershire. A very tight hard fought game was decided by an Oadby goal a few minutes into the second half, the boys fought to the end and got a penalty kick 5 minutes from time when Harvey Osborne’s goal bound header was handled by an Oadby player to prevent it going in the net. Sadly the penalty struck the bar and despite further Droitwich pressure they were unable to take the game to penalties. Overall though a great performance from the boys in the final and an amazing and unprecedented achievement to get to there in the first place. The picture attached was taken shortly after the game and their faces tell the story of their disappointment. The boys are (from to left to right) starting at the top, Isaac Pepper, Luka Ferguson, Adam Hanson, Lucas Pepper, Luke Bahia, Harvey Osborne, Samuel Lea. Bottom (left to right) Ewan Carter (Vice Captain), Shravann Raajkumar, Joshua Hurdman, Jenson Warrier (Captain) & Alfie Bateson. All the boys should be very proud of their efforts and achievements this season and when the dust settles they surely will be. They are a credit to their Club, their parents and their coaches, we hope that they can go one better next season and bring the Cup back to Droitwich.